A RUP LIFE: George Lopez: The Complete Third Season Now Available! George Lopez: The Complete Third Season Now Available! ARuplife was provided a sample to help facilitate this post. The post contains affiliate links. I have to confess - I love The George Lopez show! I used to watch it all the time when I was pregnant, up late and couldn't sleep! It has that feel good, laugh out loud quality! 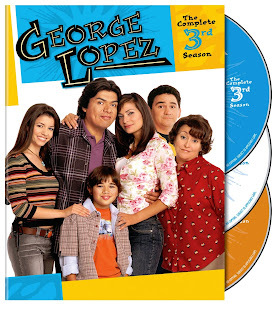 Get set for non-stop laughter and good times when Warner Bros. Home Entertainment (WBHE) brings the third season of the groundbreaking hit television series George Lopez to DVD July 16, 2013. Starring multi-talented entertainer, George Lopez, as the head of the delightfully hilarious Lopez household, George Lopez follows the exploits of an endearing and uproarious blue-collar Hispanic family living in the suburbs of Los Angeles. Titled George Lopez: The Complete Third Season, this three disc set will include 28 half-hour episodes and will retail for $29.98 SRP. In Season Three of George Lopez, George’s life hasn’t become any less complicated. Benny starts dating a younger man named Randy. George learns his father is in need of kidney transplant. Max forges his parent’s signatures to cover up that he’s failing in school, and Benny is blamed after the aviation factory George works in is vandalized. Other unexpected surprises that make this season a must-watch include a long lost sister, a trip to “the happiest place on Earth” and a guest appearance by Sandra Bullock. 10. Would You Like a Drumstick or a Kidney? You can purchase your copy at your local store or online at amazon!